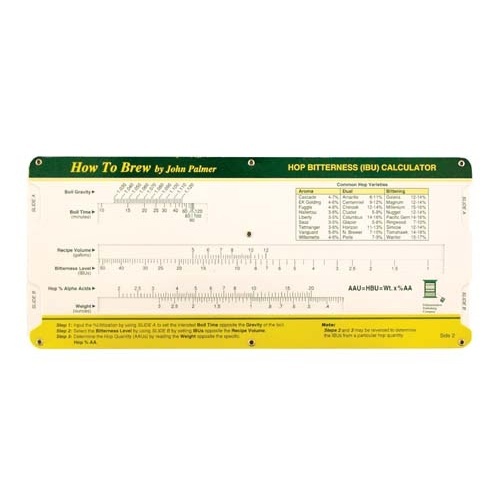 This beer recipe calculator is capable of doing numerous brewing conversions on the fly! It is made with a heavy and durable paper, is coated for water-resistance, and is able to crunch tall gravity conversions in a single slide! Other features include a Recipe Volume-to-Bitterness chart, A Boil Time-to -Boil Gravity chart, and a chart to tell you the gravity contribution of DME, Base Malt, and Specialty grains, just to name a few. A great tool for making quick adjustments during your brew. Want to learn more and this seems a good way to learn a bit more. Good product. Has all the info at your finger tips. Helpful in understanding how some of the basic parts of beer come together. Useful when needing to substitute ingredients on the go when your not yet an expert at brewing. Good quick guide for standard range of volumes.